Traveling with small children is such a joy. At least this grandma finds it a joy. Loading up the car with toys, diapers, snacks, books, extra clothes, drinks, and two small children was not my responsibility. Mama and Daddy did all that work. I just joined the group and got to play. What could be more fun? “Can you meet us at Lithia Park on Friday? It is a great place for children....and you could do some sketching!” As if I needed an extra hook to be enticed to spend time with my babies. At the appointed hour, with sketchbook and sketching tools in hand, I arrived at Lithia Park, the magical city park in Ashland, Oregon. Soon, it was apparent that sketching and grandparenting are mutually exclusive. My journal is not an indestructible preschool book and my colored pencils became far more entertaining than the swings and the ducks. I put them away and spent my time enjoying the play of two small children. A week later, on a cold and damp day, after the sunny fall days had disappeared, I returned to Lithia Park for a few hours of sketching. What follows is a story of one day that was distilled from two visits; one with my grandchildren, one with my sketchbook. We met in Ashland, a town that built beautiful Lithia Park to bring culture, beauty, and play to its southern Oregon community. It is a park with all ages in mind, but as I watched the happenings throughout the park, I am sure the designers were thinking of children. The park itself was started in 1892, just eight acres. Today, it has grown to 92 acres with a mile long trail. It is an easy walk even for a two and a half year old. 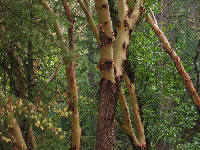 The park has been planted with natives, (alders, oaks, conifers, and madrones) and many exotic plants. There are signs along the way that describe special trees, historic sites, and interesting scientific information. There is a park headquarters and a trail guide available. The short trail could take about 15 minutes to walk, but with young children you might want to leave between one or two hours for a leisurely stroll that allows for examining sticks, leaves, rocks, bridges, and bugs. After a quick walkabout, I found a bench with a view of a grassy area littered with the fall colors of maple, oak, and alder leaves. With a few drops of water dabbed into my paints I transferred the stunning colors of the park onto the page of my sketchbook. 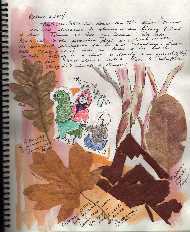 In my pocket sketchbook I captured the ducks collecting crumbs and grubs for a late afternoon snack. I like sketching in my pocket sketchbook. It frees me to experiment with drawing and the torn pages are a contrast from the sketches I do directly on the page. 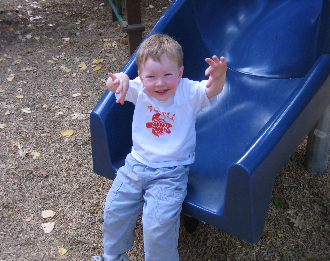 We wandered along the gravel paths and came to the playground. The tall curling slide, the swings, the ladders, and the merry-go-round were all surrounded by a layer of deeply padded wood chips. There were enough swings for everyone to have a turn, and a small slide called to the very young. A green drinking fountain with a convenient right-angle “seat” must have felt like the height of good planning to one thirsty toddler. Nicholaus, a beginning walker was able to climb to the top of the world on the climbing structure and navigate unbelievable adventures because of a parent’s steadying hand. Noah, the two and a half year old stood alone at the top of the tall slide and surveyed the distances before returning to earth. Sharing the playground was a little girl in a ladybug raincoat and ladybug rubber boots. I quickly added her to my page. She was perhaps the best dressed of all of us in the park. She was ready for the changing autumn weather with utility, style, and a touch of whimsy. 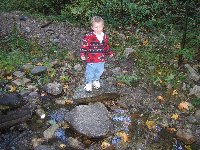 Toddlers are not the only ones to enjoy Lithia Park. There were elementary aged children playing follow-the-leader over all the equipment and middle schoolers sharing rides on the merry-go-round. Mothers and fathers happily tended children while visiting with each other. Children shared snacks from small bags and chattered endlessly. But, it is the toddlers, the ones who cannot be in their car seats for extended travel, who are the ones who really enjoy getting off I-5, unbuckled and set free, who showed the most relish in exploring the park. After the playground, we wandered down to the duck pond. The ducks, who are sure that all new comers have brought them handouts, spotted us at once. My job was to keep the 10 month old from joining them in the pond. It was a full attention job because all water forms call loudly to this youngest and most aquatic of my grandchildren. 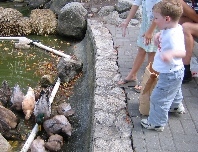 A friendly little girl shared her stash of bread crumbs and the ducks gave us a thrilling performance. Through the park, Ashland Creek separates nature from the parking lot. Crossing the creek are several bridges that were a hit with both boys. I am sure the concrete bridge felt like a fortress and the rot iron bridge gave them wonderful views of the stream flowing beneath their feet. They would run back and forth, flexing their freedoms, momentarily living wild, imaginary lives. Throughout the park are benches and meadows of grass, gravel, and wood chips. Traveling from bench to bench I found an endless variety of views. I was lulled by the burbling of the stream, entertained by the antics of the ducks, charmed by the eager energy in the playground, and greeted by friendly wanderers of all ages. 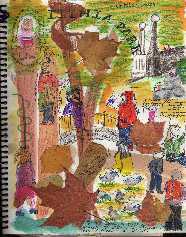 At each bench I added a leaf to my sketchbook. Sketching is not just about drawing. It is about collecting the sensory memorabilia from a time and place. Each color, each sound, each texture, carries a collection of images to my brain. A week or a month from now, I will open to this page and will still feel the cold seep into my bones from this very damp park bench. This is what I want to capture before I leave a place. Not the detailed beauty of a place, I cannot hope to do that. Rather, I want to keep the memory of duck quacks, the red gloss of a ladybug raincoat, the feathery float of baby hair on the swings, the look on my grandson’s face as he scans his horizon, the permanence of concrete bridge standards, the toddle of chubby legs, the colors of fall, the trickle of water, and the mysterious shadows hidden beneath the mossy rocks lining the creek. Lithia Park is an invitation to exploration. From open areas to hidden nooks, from playground to duck pond, you can spend hours or even days within its magic borders. We played hard and after a snack Noah and Nicholaus were ready (willing?) to be buckled back into car seats for the next leg of their journey. Another stop at a riverside park in Dunsmir, California, was their last chance to stretch before arriving at home at the foot of Mt. Lassen. A journey well planned to include the needs of two young children.